Although everybody wants a luxurious, long mane of hair, it is not always easy to accomplish this. Hair--especially if it is dry, damaged, or brittle--can become ever shorter due to splits and breakage at the ends, creating the illusion that your hair simply won't grow. In addition, harsh styling chemicals, over-processing and even too-vigorous brushing can cause hair to fall out at the scalp. Fortunately, you can use mayonnaise--packed with hair-nourishing egg yolks--to stimulate healthy hair growth. 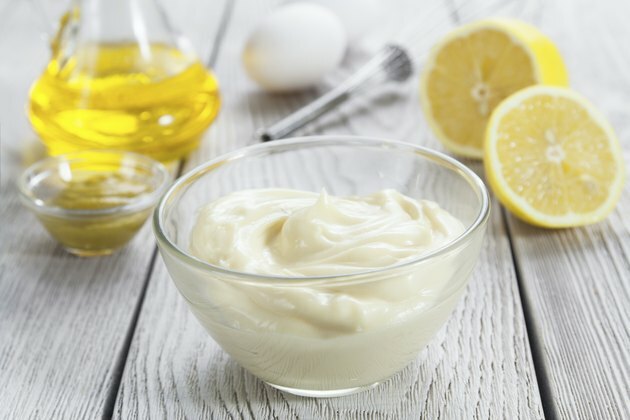 A mayonnaise hair treatment is not only safe to use, natural and inexpensive, but is also based on good science. When you treat your hair with mayonnaise, you get the benefit of L-cysteine--an amino acid and powerful antioxidant found in eggs that can give your hair strength, shine and structure. According to the Health and Body Fitness website, L-cysteine not only makes up 18 percent of your hair, but is a keratin- forming substance that increases the hair shaft and hair growth density. Put on an old smock or shirt that you don't mind getting stained, or simply apply the treatment while standing in the shower. Work a cupful of mayonnaise throughout your hair, starting from the scalp and massaging outward to the roots. Pull the mayonnaise downward with your fingers over the hair strands to ensure that they are coated, and massage mayonnaise into the ends of your hair--usually the most damaged part. Arrange the hair on top of your head in a pile. Twist cellophane wrap, tightly and securely around your head, making sure that all your hair is covered, and then wrap your head in a warm towel. Allow the treatment to stay on your hair for 20 minutes, changing towels if necessary to keep warmth radiating through to your hair. Remove the towel and the cellophane, and rinse the mayonnaise from your hair. Shampoo with a gentle, moisturizing brand shampoo that you have used in the past with good results. Repeat the treatment once a month if you have normal hair, and weekly if your hair is very damaged. By protecting the ends and avoiding breakage, and fortifying your hair with L-cysteine, you should be able to grow your hair substantially longer with the help of this mayonnaise treatment.